Dimensions: The necklace is 18 inches long; the “bee” is 3 inches wide and 1.5 from top to bottom. Description: Fine silver wings with a tiny jade on top. 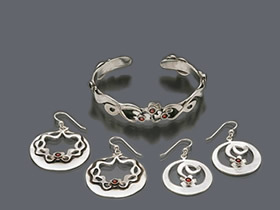 The copper layer, with sterling silver spirals, holds an onyx set in a bezel made of tiny seed beads. 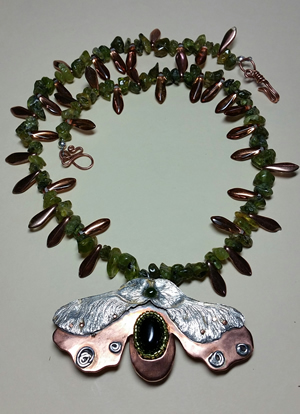 The necklace is 18 inches long and is made of chip peridot with copper colored glass beads. It is held together by a handmade clasp.